“Killer instinct” is a rare quality in the beautiful game of basketball. That is why it is always blurted out by commentators about certain players. The thing about “Killer Instinct” that makes it so intriguing, other than the highlights that it creates, is that there seems to be a belief that either you are born with it or you don’t have it at all. Maybe that’s because players that are accepted to possess this legendary quantity are so uncommon. If you get to watch a person with “Killer Instinct”, you’ll know it. Justin Williams dominated the paint for most of the game. While he is a huge scorer for the Heat, their offense doesn’t really revolve around him that much. He gets points off offensive rebounds, putbacks, and some post offense, but the Heat offense is centered around the shooting of Avenido, Viet Arnold and Dustin Scott’s versatility. In this game however, the Heat seemed to be looking to pound it into the paint and for a stretch during the start of the third quarter we saw 4 straight possessions where the Heat went through a pick to set up the entry pass for Justin Williams to operate inside. Justin ended up with 27 points to lead the Heat in scoring, but in context you have to wonder what happened here with the Saigon Heat. For 7 games before this one, the Heat bombarded opponents for an average of 23 three point attempts per game. They ended this game with 15. 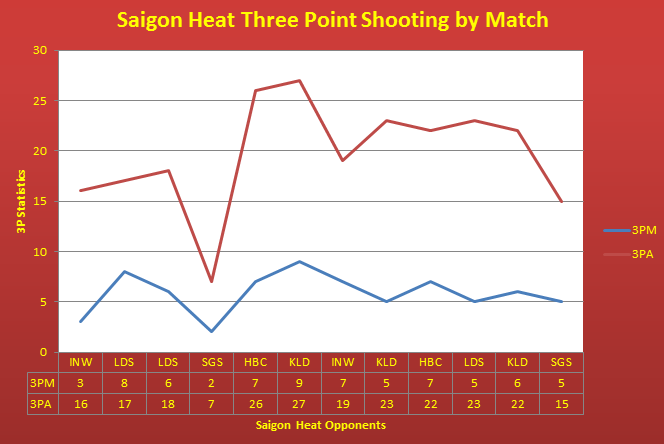 That number marks as the second lowest number of three attempted by the Saigon Heat this season. The season low attempts was 7. Who were the opponent of both games? 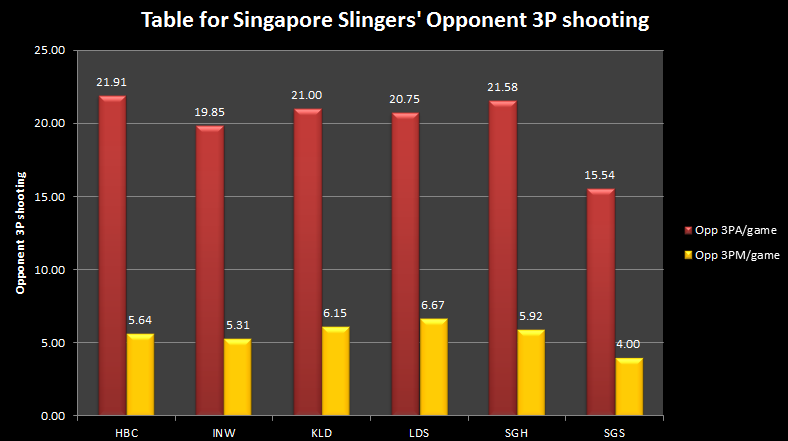 It has been repeatedly mentioned that the Slingers are a stingy defensive team. They will suffocate the three point shooters and make you get your points inside their packed up paint. 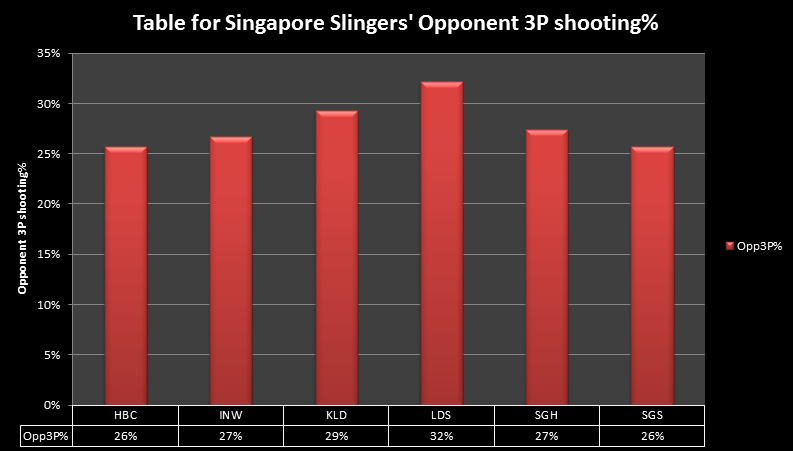 Other than allowing the least amount of three point attempts, their opponents also have the lowest three point shooting accuracy (tied with Hitech Bangkok City). With guys like Desmond Oh (who is well known for his straight-up defense) and Ng Han Bin (who is HUGE for a wing player) disrupting the Heat’s perimeter, it’s no wonder David Arnold ended up with zero points in this game. Fun Fact: Arnold has not hit a three pointer against the Slingers. This is a guy who has the third most amount of made threes in this league. Leo Avenido did his part and converted 2 three pointers, but they were both heavily contested and more of an ode to Leo’s shooting prowess more than a bad rap for the Slingers defense. It was going to be hard for the Slingers to slow down a long and quick 7 foot center like Justin Williams, so they turned to slow down their shooters instead; something they had specialized already. Judging by the outcome, that worked just fine. Justin Howard has been bouncing around South East Asia for these past few months. He played for Hi-Tech Bangkok City affilate, Thai General Equipment, in the Thailand Basketball League where they finished in 3rd place. 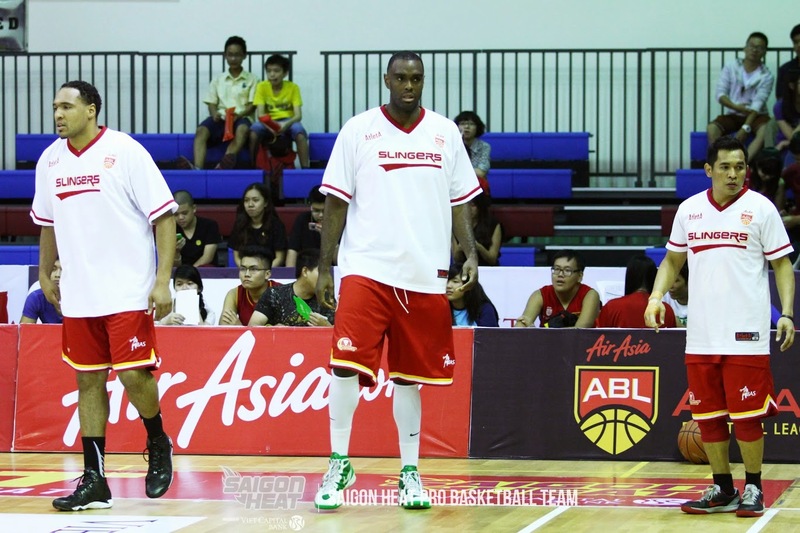 He then went on to replace an injured Chris Ellis for the Indonesia Warriors for two games and now has finally ended up with the Singapore Slingers to replace the injured Kyle Jeffers. Justin Howard is a huge addition, literally, for the Slingers as he possessed the height and offensive touch inside that the Slingers had been lacking. Jeffers had been a workhorse and hustle player, but he had been shooting only 30% against Hi-Tech, KL Dragons, and Saigon Heat; teams who have been able to throw bigger centers to defend him. Justin Howard changes that. Howard is a space eater who has a soft touch around the rim as he showed over and over again in this game. He ended up with 18 points off 8-19 shooting and 20 rebounds. The Slingers were off from the three point line in this game (3-13) which was the main reason they won their last game against the Heat. Without Larry Liew and off nights for Ng Han Bin, Dior Lowhorn, and Wong Wei Long, Justin Howard complemented them well with his inside offense. He looked a bit winded heading towards the end of the game and his defense left quite a lot to be desired, but his length alone disrupted Justin Williams a lot. If Justin Howard sticks on to this team and they develop towards each other well enough, this is a potentially very scary team. The Saigon Heat owner is Connor Nguyen. Having been granted the opportunity to be able meet with Connor in a couple of occasions, Connor seems like a really cool guy. He certainly knows what he is doing with this team and its development and he certainly knows how to do it. Connor tends to stand in the corners of the stadium on gameday and watching Connor from the sidelines during the game is quite fascinating. During even the most emotional runs of the game, Connor is able to keep his cool. Notice how cool he is while the rest of the crowd reacts to the missed shot. For a more level of intense celebration, he switches to a nice gentle slow clap. At the peak of emotional celebrations, Connor unleashes his fist pump. In smaller leagues like the ABL, it is fascinating to be able to follow the people behindeverything at a closer distance than that of bigger leagues and as a fan of this league I am grateful for that. I don’t usually take selfies and this picture just goes to show you how awesome this guy was. People are defined by their how they perform when the spotlight is shining on them. And when the spot light went to Wong Wei Long, he simply put on a show. Cool as Ice. Wong Wei Long. Let’s call him the assassing [be]cause that’s what he’s doing to the Heat. (Slingers bring up the ball) I’m biting my nails are you? (Wei Long drives on a pick toward the free throw line and gathers for the shot) He’s become Kobe Bryant! (Wei Long releases) It’s another free throw [shot] here! (We Long makes the shot) The Singapore Mamba. The Assassin. Subzero. Call him whatever you want. He’s got ice in his veins. Wong Wei Long has been one of the best Local ABL players this season, scoring at 11.08 points/game. That scoring accounts for 16% of the Slingers scoring which also top the locals in the ABL. This type of volume scoring might be a result of the structure of the Slingers offense. The other teams in the ABL have their world imports as their offensive fulcrum (Chris Charles/Hitech, Tremayne Jones/Warriors, Williams/Heat, Falando Jones/Laskar Dreya, Chris Eversley/Dragons). The Slingers started out the season with that same blueprint, having signed Hassan Adams, but Adams ran into some injuries and eventually was released as mentioned. While Kyle Jeffers is a capable scorer, it is not in his nature to score, and Coach Neo was forced into more options. 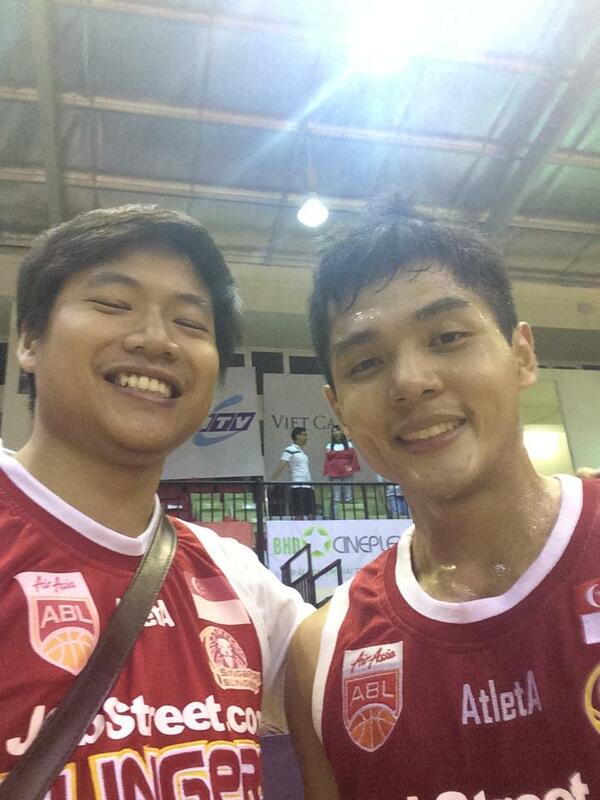 Wong Wei Long rose up the occasion grandly and scored 23 points in their first match without Adams. 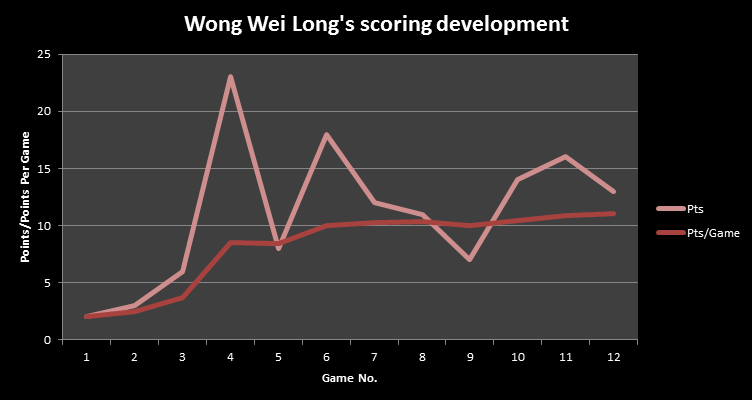 Since then Wei Long has been averaging 13.55 point/game. 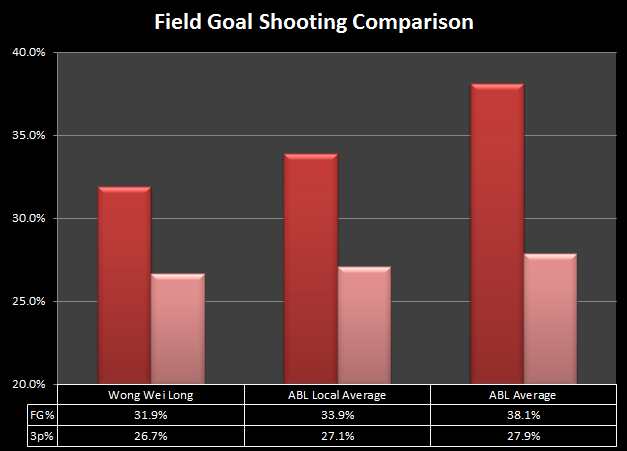 But even so, amid the high scoring numbers Wei Long has not been that efficient in scoring those baskets. His FG% is at 31.9%, well below the league average (38.1%) and slightly below the ABL Local average (33.9%). But if you are wondering why he is still getting the green light to shoot with his pedestrian shooting percentages, scroll up a bit and watch him ice those last three shots again. Imagine the pressure of a team with the offensive firepower of the Heat suddenly breathing on your neck. Imagine yourself in that same situation. Those were shots he had to make. You know a guy has got killer instinct when he can lower the volume of the home crowd in the midst of a comeback 3 times in a row. And there you have it, Wong Wei Long, the cold blooded Singapore Assassin. Certainly a player with killer instinct. The Slingers are set to play Hi-Tech Bangkok City in a rematch of their epic showdown last time at OCBC arena (which I have not gotten hold of the game tape, hence no recap). They are to play at OCBC Arena again on Friday 19, September at 8:00PM +8GMT. The Heat will be looking to reclaim the final playoff slot in a match up against the Indonesia Warriors this Sunday 21, September at 6:00PM +7GMT. The Heat can make a bold statement for their claim to make the playoffs with this win, so the court side experience should be amazing at CIS Arena.